Before discussing the high-Reynolds-number flows, it is worth to consider a thermal boundary layer, to develop the physical intuition that will be useful later. Imagine a hot streamlined body in a ﬂow of cool air. The heat is transferred by heat conduction process across ﬂow streamlines from the body into the bulk of ﬂuid. At the same time the heated air moves along the surface and carries (advects) heat with it. 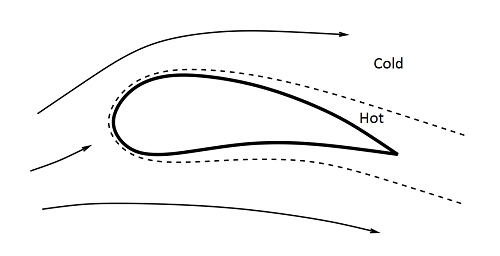 If the ﬂow velocity is suﬃciently high, the advection will dominate so that the air will be hot only inside a thin layer adjacent to the body, as shown in the figure. This layer is called a thermal boundary layer. It should be intuitively obvious that the stronger the advection is as compared to heat conduction the thinner the boundary layer. Note that if the temperature far upstream is zero then it will be quite close to zero almost everywhere in the flow except the interior of the boundary layer. Now we are ready to consider what happens in flows at high Reynolds number.